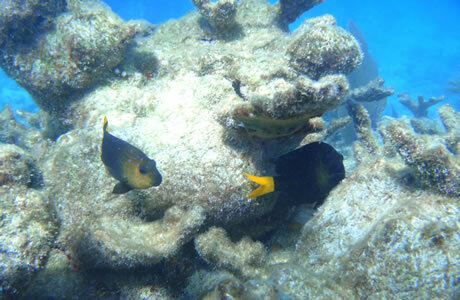 The USS Curb is a 300-foot naval salvaging tug boat that has been converted into an artificial reef located one mile south of the Cayman Salvager artificial reef. This dive site is definitely for advanced divers with a depth of 185 feet. Resting at the bottom of the ocean, the ship sits upright and includes many nooks and crannies to explore. The ship was originally constructed in California and was first launched from port in 1943. She participated in a number of war-related activities but was decommissioned only three years later in 1946. In November of 1983 she was sunk to create an artificial reef at the present site deep underwater. You can penetrate the interior of the ship, but you should do so cautiously since there is a fine silt inside which can obscure visibility once stirred up. It is best to penetrate the shipwreck with an experienced guide—although if you are an advanced enough diver you may do fine on your own. When the ship was worked on prior to sinking her, openings were deliberately placed so that divers could explore the lower deck and other areas. Few divers come to the USS Curb since it is so deep underwater and presents a number of hazards. The result however is that if you do make it to the site, you'll be able to enjoy the company of a number of larger Jewfish and cobia. These fish are more curious about humans than frightened of them since they have had so little contact. You may also find snappers, hogfish, pompano, tarpon, and a number of tropical fish. Due to the depth of the site you should conduct only decompression diving in this area. The Cayman Salvager, located a mile away in 90 feet of water may present a slightly less challenging expedition of you do not feel up to visiting the Curb—though this is still an advanced dive and should be undertaken as such.